"The Casale Sonnino was an experience unlike any other, with the vineyards, the feel of true Roman living and the food!!! We stayed for a week and enjoyed the local wine and restaurants and loved exploring the surrounding hill towns. We even took the metro into Rome and it was quick and easy and inexpensive! It's a once in a lifetime way to travel!" "The Casale Sonnino was the single most important factor in making the our trip to Rome a success… The Casale itself rests on a foundation that is 2000 years old in parts, but the house is fully modern, spacious and absolutely immaculate. The setting is inspiring, bucolic and secure. The owner is a wonderful host. He was born, raised, and educated in the US, so he speaks perfect English as well as Italian. He is friendly, accommodating, knowledgeable, We literally couldn't wait to wake up each morning after a good night's sleep in comfortable beds to the waiting breakfast spread over looking ancient Roman hills. After a long day of sightseeing, we had this beautiful villa all to ourselves…"
The Casale Sonnino is a fully renovated 18th Century Villa, built upon foundations dating back to 100 AD when the property belonged to the Roman Senator, Julius Cornutus Tertulus. 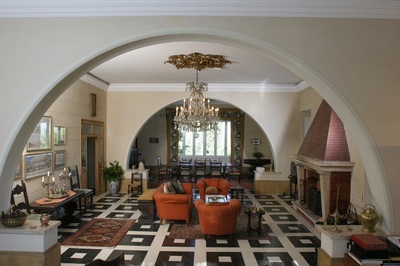 The villa is surrounded by 30 acres of gardens, vineyards, olive groves, cypress trees and a magnificent Lebanon Cedar. Make the Casale is your home away from home while you explore Rome and tour Central Italy. 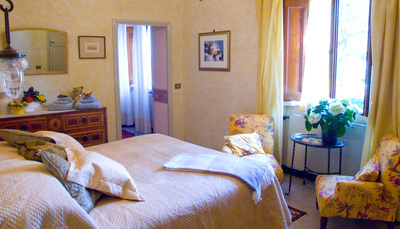 You'll wake up to the aroma of fresh Italian coffee and eat breakfast with the sun streaming in from the garden. Spend the day as you please and leave the cleaning and responsibilities behind. When you return in the evening, all you need to do is pour yourself a glass of wine, bring it up to the terrace and inhale the amazing view of the sunset over Rome and the sparkling panorama stretching from the sea to the Apennine mountains. The Casale sleeps up to 10 people in 4 bedrooms and 1 terrace room upstairs and 1 small bedroom on the ground floor. There are 3 full updated baths - 2 upstairs, 1 downstairs. There is plenty of room to relax and gather for meals in the expansive 20’ x 40’ living/dining room with fireplace and chandelier as centerpieces. The fully equipped vintage kitchen has all the modern amenities to whip up an Italian feast. The Casale is available year around for stays of 5-days or longer. Typically, weeks run Saturday to Saturday, but the owners try to be flexible according to your requirements. 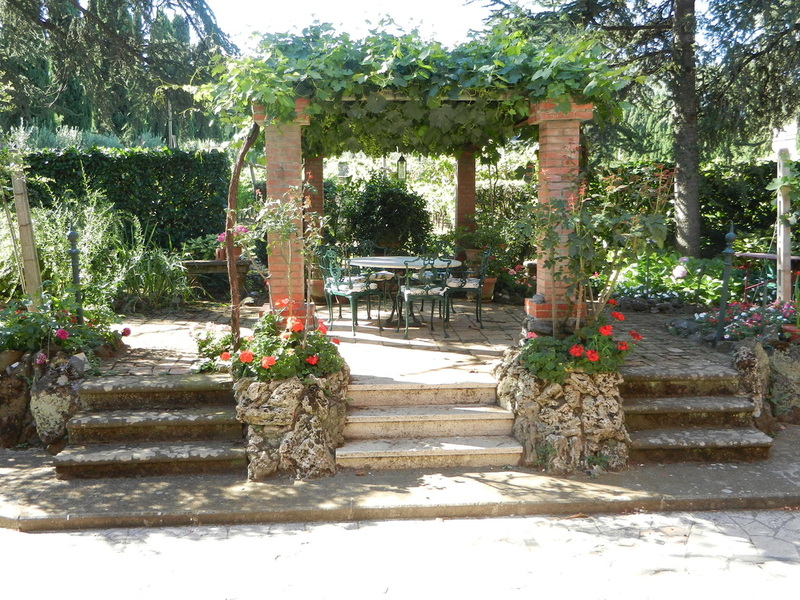 At the Casale Sonnino, you can savor the authentic Italian country life, in a home with a true bygone atmosphere, and still be a stone’s throw from the museums and historic sites in central Rome. Strategically located near the charming hill-top towns of Monte Porzio Catone (1km away) and Colonna (2km) and just a 10 minute drive to Frascati (4km). 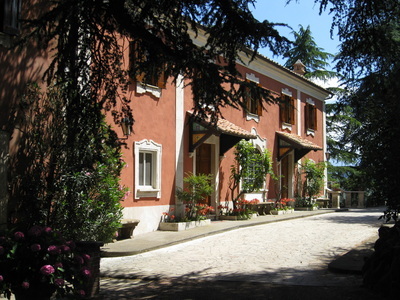 Rome center is 25 kilometers from the Casale and is easily accessible by train from Frascati or Colle Mattia (1km). You may also drive 20 minutes to the last two stops of Rome's modern metro at Anagnina and Cinecittà. With any option, it takes less than an hour to arrive at Rome's Termini station. The Casale is a perfect home base for exploring Rome and Central Italy from Florence to Amalfi Coast to the mountains of the Abruzzo in between. 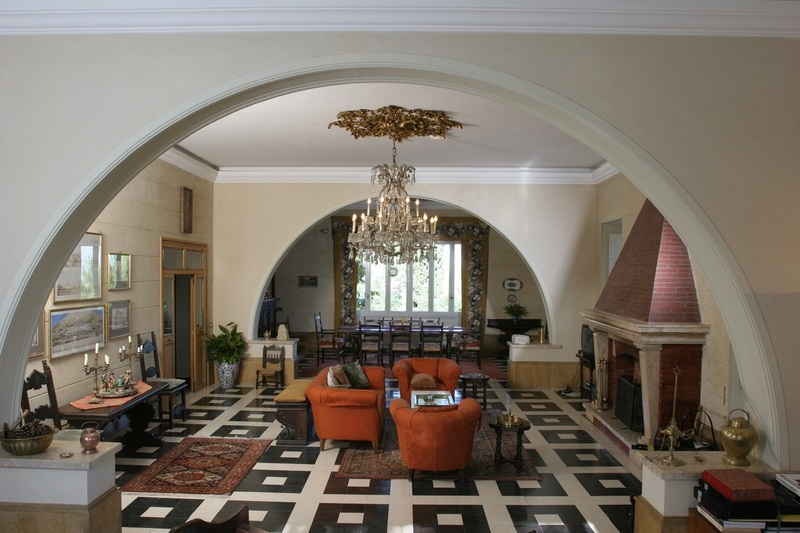 Weekly rates for up to six people range from 2700 Euros – 3300 Euros Christmas/New Years. Each additional person, up to 10 is 350E per week. The rental includes: daily continental breakfast, housekeeping (at least 5/days per week), wifi access, most utilities and use of the kitchen, house and garden. Heat is extra based upon consumption. We can arrange home cooked dinners prepared at the Casale by a personal chef for an added charge. A tour guide/driver in your rental car to show you around Italy, so you can enjoy with no stress, is also available upon request. 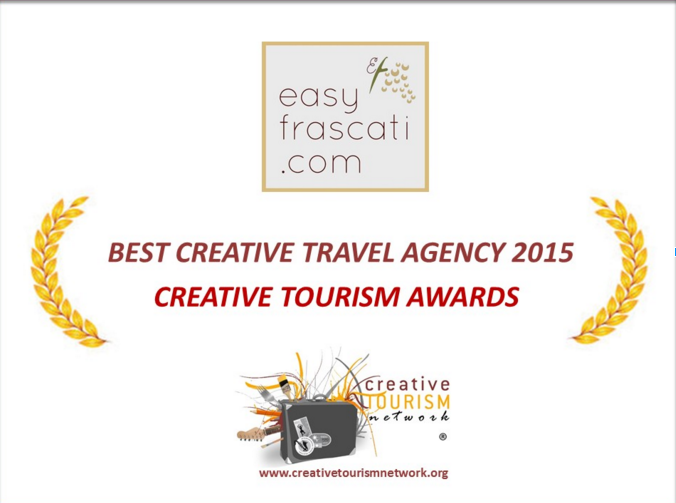 Easyfrascati.com pass holders are entitled to 10% discount on the above rates.